What I have decided to do is just keep posting about how bogus the Republican party is in their propaganda campaign regarding the deficit. Republicans run up deficits, but they rail against the deficit when Democrats are in the power seat. 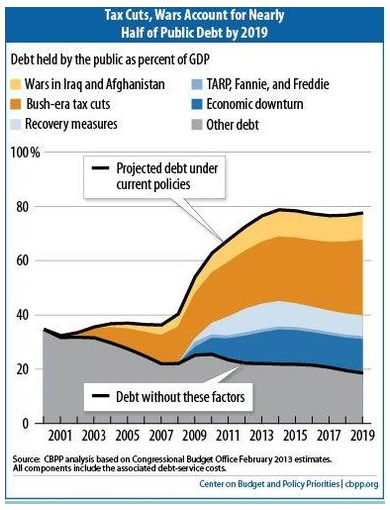 Here are a few good pieces regarding the deficit, austerity, sequestration, blah, blah, blah…you get the point. This entry was posted in Economy and tagged austerity, Boehner, Deficit, Sequestration on March 4, 2013 by speakingthosethings. You are so right, It certainly was never about the deficit. For me it’s simplistic in nature…..so simple that a blind man can see it. This is about the bigotry and vile hatred that still exist in the underbelly of this country. Electing a brilliant Black man to the White House not once but twice was like picking a huge scab off of a festering oozing puss filled sore. Now add to that the socioeconomic disparity between the haves and the have nots and you have yourself the new GOP (Grand Ole Party of the Teabaggers Klu Klux Klan) digging their heels in to assure that they don’t disappear from the face of the earth like the dinosaurs. Numbers do not lie. This Country is steadily climbing out of the deep abyss that the previous administration dug us into with shovels of gold. Tax breaks for the rich, subsidies for big oil companies and credit card wars…..yep that’ll do it alright. Heaven forbid that President Obama’s legacy would be recorded in the annals of history as saving us from a full blown depression. How is it that people still believe that the GOP is really a viable entity? Can Fox listeners really be that stupid? Oh wait, we are using big words like, austerity, sequestration and deficit to people who can’t quite figure out how to spell “A”. Yep, the GOPers have lost their minds. I agree that for them it’s about destroying the Obama legacy, plus they’re mad because they caved during the fiscal cliff. If they focused on jobs the way they are focused on austerity, this recovery would have been a lot stronger by now. Instead we’re potentially headed backward. Figures. If Republicans are involved, it’s backward momentum.